What makes a moment special? Moment Brew is a mobile augmented reality product that allows users to visually express and capture their thoughts, feelings, and context of their unique coffee-accompanied moments and share them with others. It also opens up new possibilities for enhanced social interaction, as it allows users to draw on the same 3D world - both synchronously and asynchronously - even when they are physically apart from each other. Mainly contributed in UI, logo design, interactive prototyping, and video production. 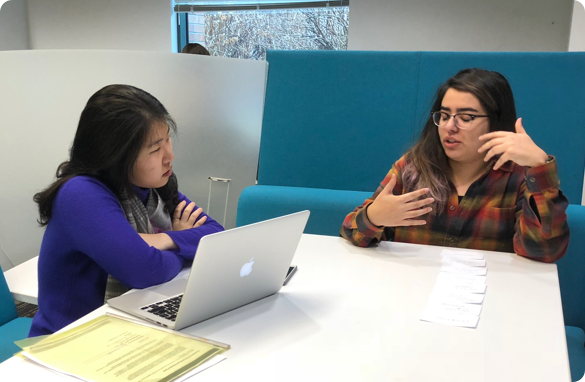 Lead concept definition, ideation, and helped usability studies. What makes a (coffee) moment special? The beginning of this concept rose from my passion with coffee and my passive observations on people's behaviors at coffeeshops. People buy coffee for various reasons, and their experiences with coffee are often unique, whether it is meeting new people, studying with classmates, having a date, solitarily enjoying coffee, listening to music, reading a book, or visiting a new place. With this in mind, I planned to explore a fun way to capture or co-capture coffee-accompanied experiences. Through this project, my team sought to explore how we can help people capture and share special and memorable moments more effectively. Specifically focusing on coffee-drinking activity which contains a lot of potential ingredients of a unique/memorable moment, we executed human-centered design process throughout the 10-week period to create a design solution that can enhance people’s everyday experience of capturing/communicating their cherished moments. We conducted a multi-methodology research effort to better understand how people define their unique moments, how they wish to capture them, their coffee-drinking experience & current use of technology, and how academic researchers have sought to explore these questions in their relative fields of study. A uniqueness of moment motivate people to capture and share them with others. With this card-sorting exercise we wanted to know what ingredients compose a unique/special moment. This was an important interview question, because it helps us understand what components are prioritized over the others in a given moment. We wanted to see if coffee-accompanied experience had different priorities of ingredients. Emotion/feeling and people were ranked the highest in both general and coffee-drinking context. We saw a hierarchy emerging in the participants’ responses: the seemingly separate components turned out to be codependent and ranked in different levels of influence. At the top, emotion/feeling positions itself as the bigger umbrella that’s influenced by other components. Similarly, there were some lateral and pseudo-influencing relationships. For example, weather is influenced by location/time. Activity and people can be related, since a meeting usually takes place when two or more people gather. How do people capture and share their coffee-accompanied moments currently? 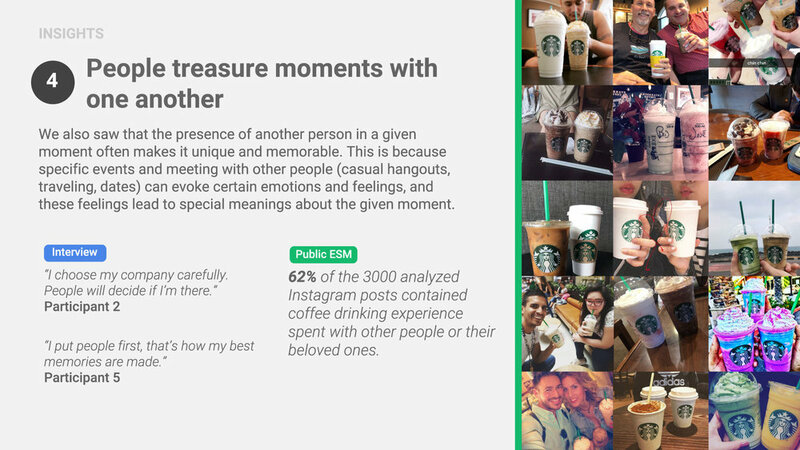 In order to understand people's current behavior in sharing and capturing coffee moments, we analyzed public ESM data from public Instagram posts containing #starbucks. 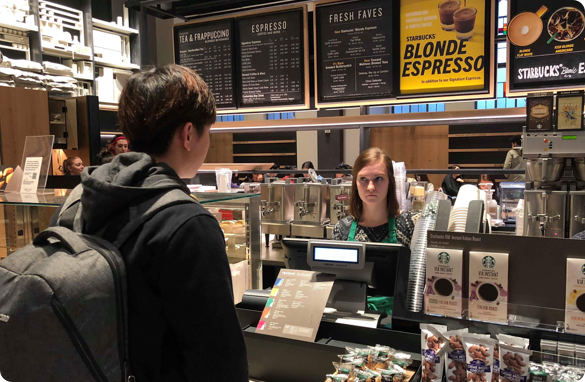 We chose Starbucks because it is one of the largest coffee chains, and we speculated it would have a big social media presence. We utilized a Python script to scrape about 9500+ public posts, then and conducted a manual categorical analysis on randomly chosen 3000 posts. To start out the ideation phase, we conducted an affinity diagramming exercise as a team to examine emerging patterns and groupings of objects, materials, and activities around coffee-drinking and moment-capturing. 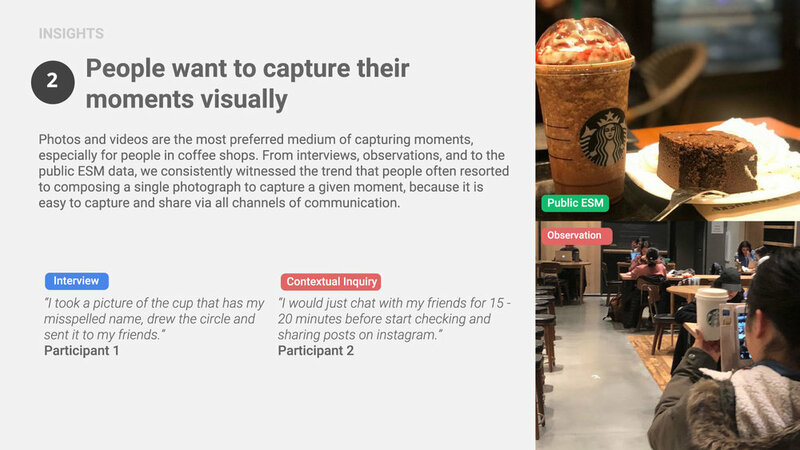 Based on the affinity diagrams and our previous research insights, we realized that the ideas around moment-capturing in the context of coffee drinking differ by the intents of capture and the objects of capture. We clustered them into the following three different user scenarios. These 3 user scenarios we have can be visualized as the user flow below. As this flow shows, the unique moments in coffee drinking can occur once the user picks up the drink. Using the three insight-driven user scenarios, we conducted a series of sketching sessions to brainstorm and come up with possible features and methods that could potentially improve the current ways of moment-capturing in the context of coffee-drinking. The ideas spun around at different stages within the three user scenarios we have. 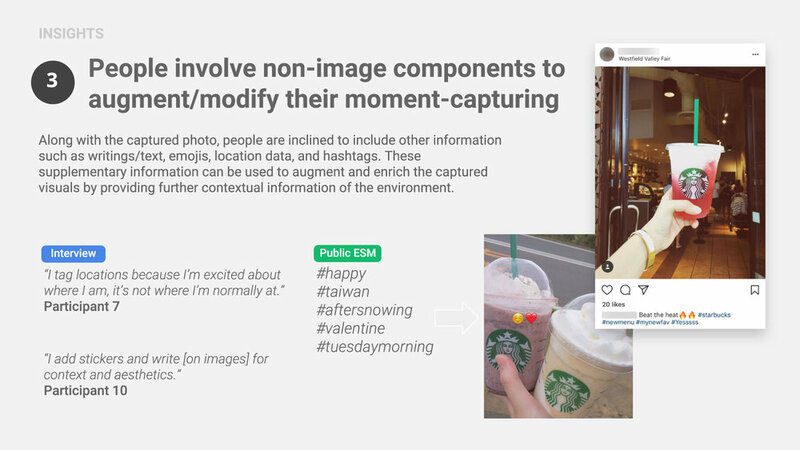 While some focused on providing fun ways of moment-capturing, some ideas revolved around setting a unique moment such as social planning and coffee recommendation. 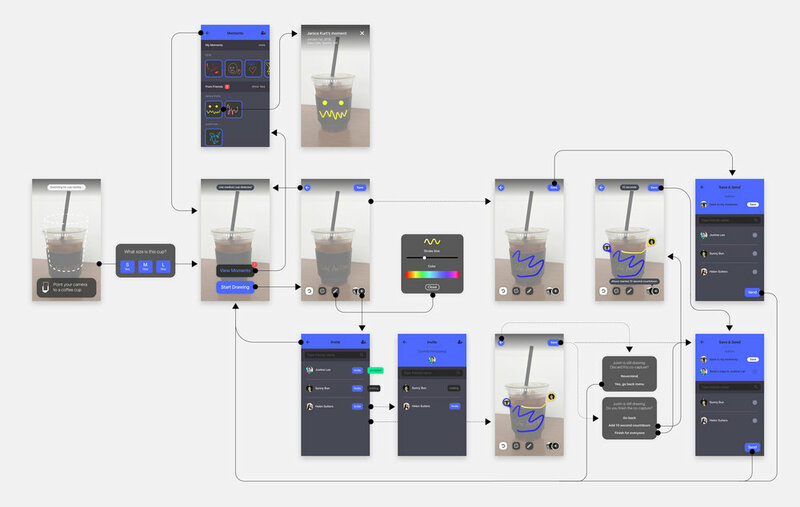 The final concept, Moment Brew, allows users to add 2D freeform drawings in a 3D world. It enables users to express and capture their thoughts, feelings, and experience in a visual way. It can also help them experience their special moments in a more meaningful and creative fashion. It also opens up possibilities for enhanced social interaction, since users could also simultaneously draw on the same 3D world even when they’re physically far away. They could also save these illustrations based on geographical location or fixed anchor point (e.g. unique marker on an object), and share to others who would encounter the same location/object in the future. Why use cups as the “canvas”? We decided to have users create drawings around a fixed anchor point - namely, the cup they drink from - for couple of reasons. Technical feasibility Current AR technology does not allow smooth 3D drawing experience when there is no anchoring object defined. (ie, Vuforia Chalk) Therefore, setting the cup as the user’s “canvas” can alleviate this problem. 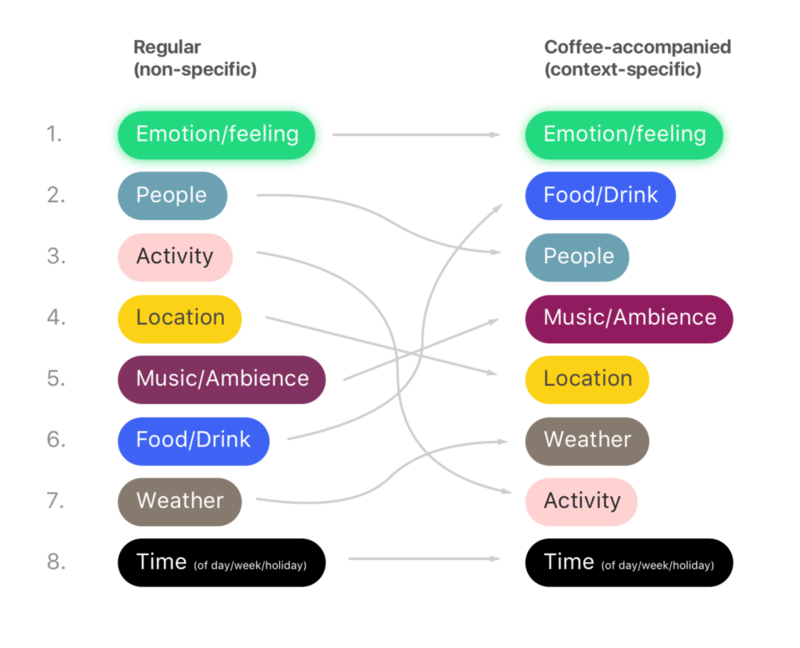 How is Moment Brew human-centered? 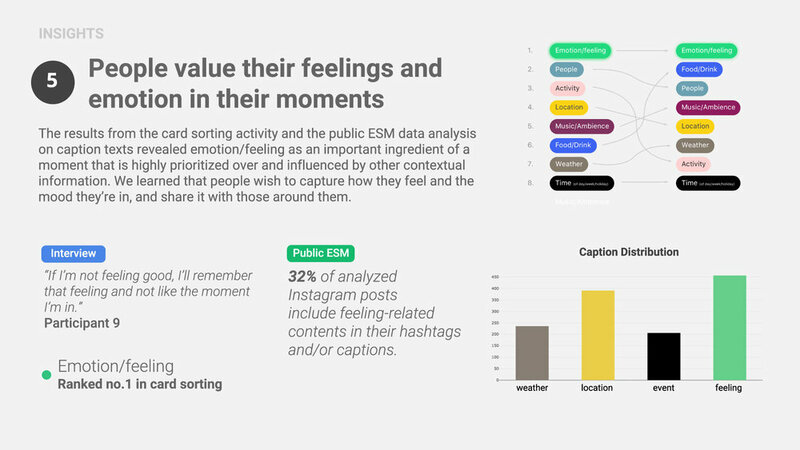 Insights from our user research revealed people’s desire to communicate their feelings/emotions by capturing and sharing them in some form, since they are considered as the most important ingredient of a special, memorable moment. This is also closely related to their desire to socially connect with others by doing so. Moment Brew caters to these human needs and desires by allowing people to freely express their feelings and share them with others in a visual and creative way. This concept explores new ways with which people could communicate their thoughts and ideas, and could potentially add another depth in how people archive and consume their experiences. 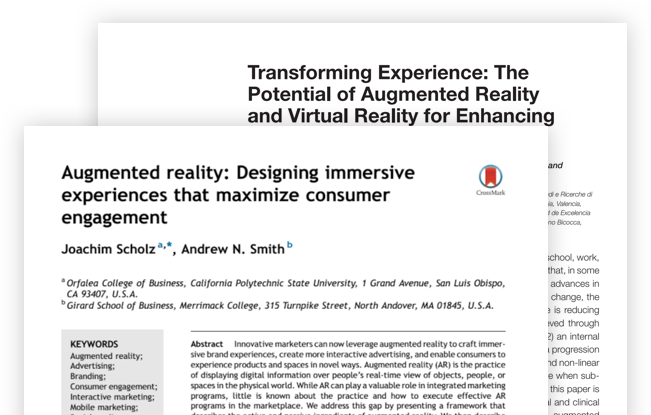 Though we have created a paper and digital 2D prototype, we also agreed that AR can be hard to imagine with such conventional prototyping methods. 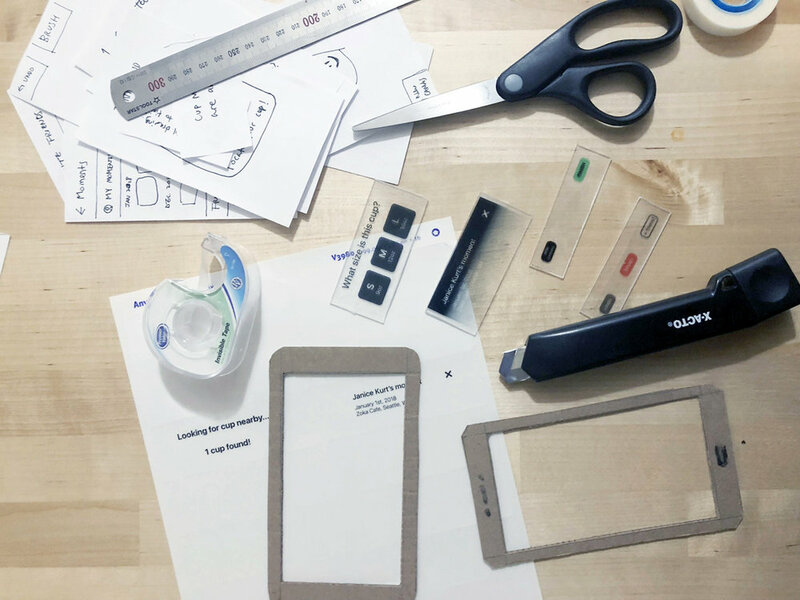 To better understand people’s behaviors in mobile AR interaction, we created an AR cardboard prototype with frosted plexiglass and transparent ink-jet printed stickers. In this prototype, the cardboard frame mimics mobile AR screen, and the frosted glass panels with stickers mimic UI elements on top of the AR screen views. For the first version of AR application, we would like to implement the solo drawing feature to determine technical feasibility and assess the utility of the 3D drawing feature. In order to create the 3D solo drawing Augmented Reality feature, we need to create a surface on the cup that worked as a canvas that allows users to draw and write on. Using the Vuforia cylinder image target engine, we detected specified cup. Then, the mobile will listen to the touch events on the mobile screens and send the data of touch coordinates on the screens to the canvas. The canvas will convert the mobile coordinates and generate them into line features or drawing paths on the cup. We decided to implement just only solo drawing feature because we didn’t have enough resources (e.g. time and incentive) to implement and deploy other two features, collaborative drawings and moment archive. Showcased and demoed at University of Washington and HTC Seattle.